Mmusi Maimane says he has full confidence in the DA Eastern Cape leader’s abilities. The DA has announced its Eastern Cape leader, Nqaba Bhanga, as its premier candidate for the province ahead of the 2019 general elections. Last year Bhanga, former member of Cope, was elected DA Eastern Cape leader replacing recently ousted Nelson Mandela Bay mayor Athol Trollip. 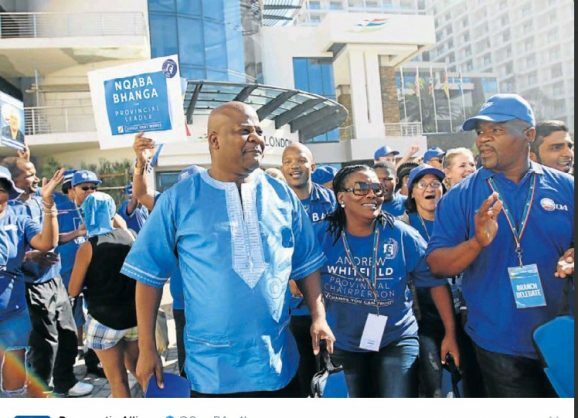 DA leader Mmusi Maimane said during the announcement of Bhanga’s premier candidacy that nominating him to run for premier had been an easy decision because of how he had excelled as a DA provincial leader. Maimane said Bhanga, along with an experienced team, will launch an election campaign across the length and breadth of the province. According to Maimane, Bhanga will be tasked with continuing the party’s efforts of fighting on behalf of the farming community of Gwatyu “to ensure that those who have been living on and working this land can finally see it transferred to them”. Maimane said he has full confidence in Bhanga’s abilities to deliver these results. Maimane said during his high school career, Bhanga was elected regional chair of Congress of South African Students (Cosas) – which is an ANC aligned organisation. Bhanga then later served as the national secretary general of the South African Student Congress – also an ANC aligned student movement – before becoming the youth leader of the breakaway COPE. “He would go on to become a COPE Member of Parliament before his encounter with Athol Trollip convinced him to switch to the DA,” Maimane said. The DA recently announced City of Tshwane mayor Solly Msimanga as the party’s candidate for premier of the Gauteng Province.